Small molecules that act through an allosteric mechanism to modulate activity of a protein target are abundantly represented in the pharmacopeia. These allosteric modulators are, however, preeminently therapeutics for eukaryotic diseases rather than therapy for prokaryotic infection. Recent examples of the success of biochemical and computational screening methods, paired with protein structural characterization, underscore the promise of allosteric activity modulation as a new approach for antibacterial discovery. In this review, we show how allostery has been leveraged to this objective. 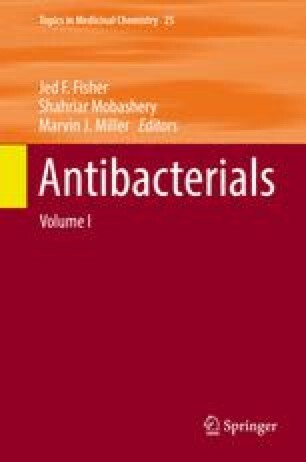 In particular, exploitation of an allosteric site on penicillin-binding protein 2a – the resistance enzyme of methicillin-resistant Staphylococcus aureus – demonstrates both that allosteric-modulating structures may themselves possess antibiotic activity and additionally may act as synergists within multi-drug combinations. Future discovery strategies against both old and new bacterial targets may exploit the opportunities offered by allosteric checkpoints within critical bacterial pathways. We gratefully acknowledge funding of this work by NIH grants AI90818, AI104987, AI116548, and GM61629.